The Australian Packaging and Processing Machinery Association announces that submissions are open for the 2011 Awards of Excellence, scheduled to be announced at AUSPACK PLUS in March in Melbourne. The biennial APPMA Awards of Excellence are conducted by the Australian Packaging and Processing Machinery Association to recognise the efforts of companies as well as their employees and acknowledge the skills required to succeed in the packaging industry. The APPMA Awards of Excellence are proudly supported by DB Schenker, Midway Metals, PKN, SEW Eurodrive and SMC. The APPMA Awards encourage entries from any company that meets the membership requirements of the Association. Mr Rob Lawrence, Chairman, APPMA says that the focus of the Awards will be directed towards business improvements that bring tangible benefits to the supplier or customer. These would include, for instance increase in sales or profit for the machinery supplier, or an efficiency increase or cost reduction to the customer using the packaging machinery. The packaging industry awards will be presented to both the company submitting the award entry to the APPMA and where applicable, to the company’s customer. Awards categories include Export Achievement Award, Design Award, Customer Participation Award and the Imported Equipment Award. This award recognises a worthwhile contribution made to an existing or new export market. Contributions can include establishing a new market, achieving a significant increase in sales by both the supplier and the customer, identifiable by monetary gain from an export activity. It can also be any developed packaging or processing machinery sold into overseas markets, which contributed to improved business outcome, efficiency, sales and profit increases. The Design Award recognises the development of a packaging or processing line or module that results in the significant advancement of packaging and processing machinery technology. The development could either be a new idea or modification of an existing principle. The design concept and implementation are weighted highly in the award decision, where better business performance must be achieved. This Award aims to recognise a company’s efforts in customising packaging and processing machinery to suit a customer’s individual needs. 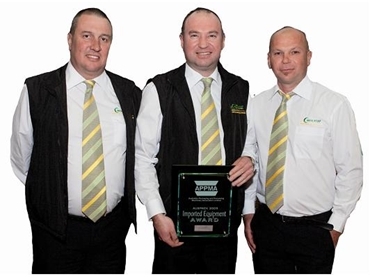 The award entry should be able to demonstrate that the end user has experienced increased sales, increased plant efficiency and profitability. This Award recognises the efforts of an APPMA Member or Company eligible to be an APPMA Member who promotes their overseas principal’s equipment in the Australian market. The equipment must represent a high standard of excellence in every respect relevant to the industry. Additionally, the equipment must be principally designed by an overseas supplier who is represented by an APPMA Member/ Company eligible to be an APPMA Member. Moreover, the processing or packaging machinery sold into Australia must demonstrate an increase in efficiency, sales and profit. All submissions are due no later than Friday the 18th of February 2011.